Last Thursday, I went to Angel’s school because they had a simple school parade in celebration of the Nutrition Month (held every July). The preschool children were wearing all sorts of fruit and vegetable costumes. But I think more children wore fruits. That somehow indicates that not everyone are vegetable eaters. This is such a good event to instill to the children the importance of eating fruits and vegetables. I’m glad that my kids are eating vegetables, but they still have to learn to eat the undesirable ones, taste-wise, like the ampalaya and the eggplant. Anyway, let me share the collage of pictures I’ve taken for the event. 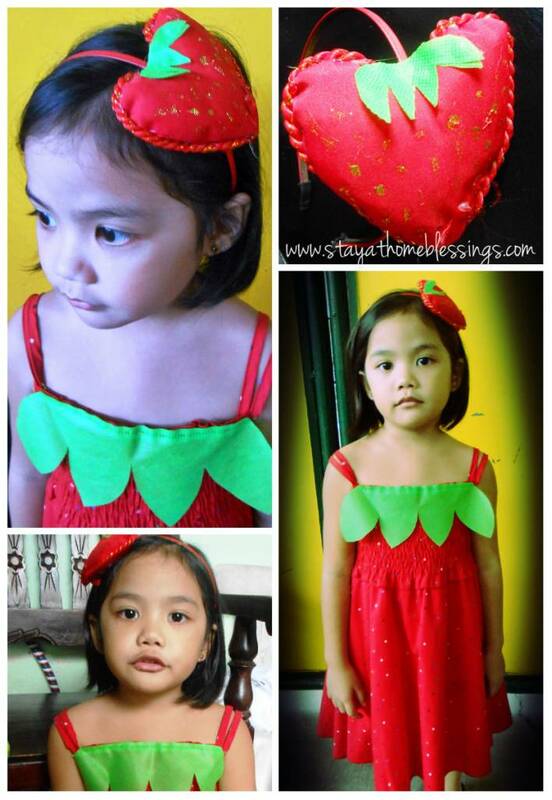 For starters, this is Angel and she wore a strawberry costume with matching hair accessory. I’ll share later how I made these at home. Next are the pictures of the kids during the event wearing different costumes. I think I saw strawberries, bananas, apple, mangoes, pineapple, corn, eggplant, carrot and pepper. There are made from fabric worn like aprons and there are some made from painted cardboard. The one that got the most attraction is the grape costume made of balloons. 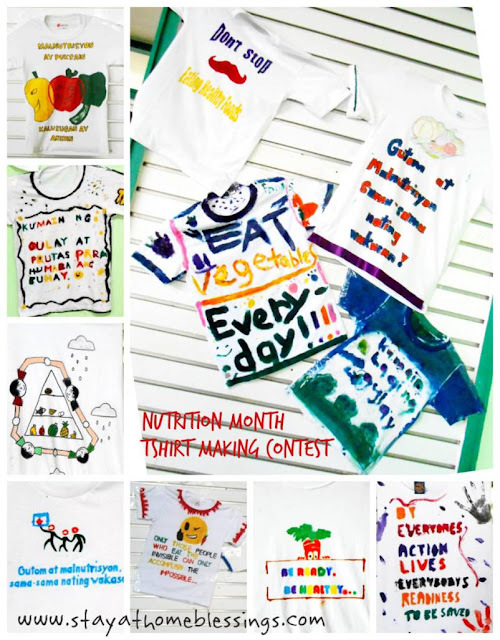 I also took pictures of the designs of t-shirts made by the Grade school students for the Nutrition Month. I think they have not yet announced the winner when I went there. Which do you think is the best looking design? 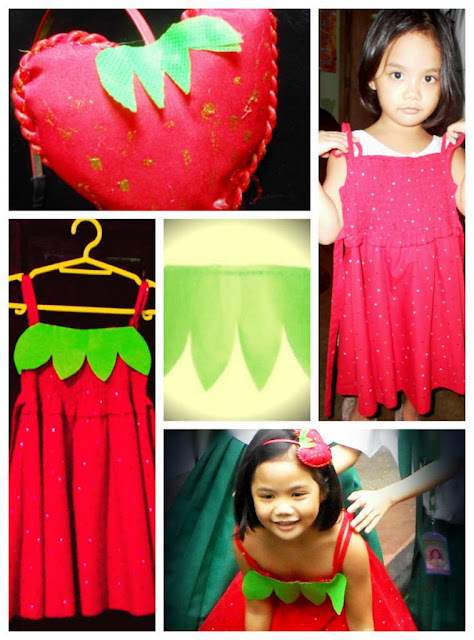 Now, for Angel’s simple strawberry costume, here’s how I made it. 1. I looked for a red dress, it’s good that it already has polka dots (strawberry seeds), which meant less work for me. 2. I cut out leaves from green fabric like in the middle of the picture above. I used a green eco bag so I did not have to buy. 3. I stitched the green leaves to the neckline of the dress, front and back. 4. For the hair accessory, I looked for a red headband, other colors will do. Then, I got a heart-shaped cushion, which was bought last Valentine’s Day, and used glue stick to attach it to the headband. If the heart cushion has a design, show the plain side. Then, I cut some leaves again from the green fabric and glued it to the heart cushion. To finish the strawberry design, I used gold glitter glue to make the dots on the strawberry. Let it dry before wearing. That’s it for this post. I hope you enjoyed the pictures and simple strawberry costume tutorial. Count your blessings! Thanks for the compliments. Got the idea also by browsing the internet. Lovely strawberry dress and hairband that you made. Great costume. I’m literally gushing over the cuteness! I can’t believe those are homemade; you really are so creative! Had to think of something…. so that I don’t have to spend more. Thanks. My pamangkins also had this in their school and it’s a great curriculum because they tend to eat more vegetables over hotdog or fried chicken. Well, it makes the parents like me aware also and makes me work harder in providing healthier dishes for my kids. Though sometimes, I’m still guilty with giving them fried foods as baon. The elementary students were very cute with their costume. We can’t do that anymore with the students in our school since most of them are being ‘maarte’ na so we let them dance and sing instead. Parades work with the little ones. The big ones can do something more complicated. So cute. Ang galing ni Mommy. Natuwa ako sa grapes costume, ang galing din ng idea haha… If Matt will have their nutrition month (wala kasi this year e) I will imitate that grapes costume, haha. I also like the grape costume but that will cost more and my girl does not like to wear balloons. Thu costumes are super cute! You did great Mommy! Nice idea with the purple balloons. 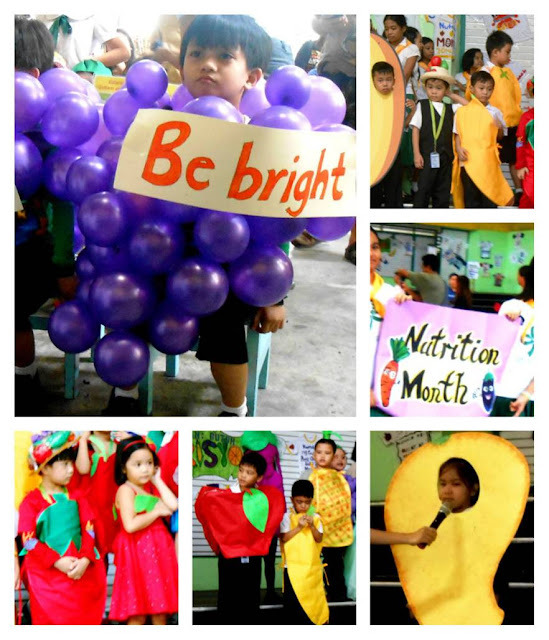 I remember my elementary days, we used to have parade carrying fruits and veggies in bilao every Nutrition Month. aww they looked so adorable! how creative of you! congrats! Very creative and resourceful. I remembered having a fruit theme christmas party and some of my colleagues went as strawberries. They mad it like they own it. You are indeed so creative! Naku I am not really crafty so I must be ready when the time comes when my toddler needs costumes and school projects. Galing! Green ecobag lang pala.. but it looks difficult to do still.. You are so good sis! I like the pen holder and the mat weave! I feel young looking at the projects! my fave art would be Isabella of Phineas & Ferb mask.. ehhehe i love watching that cartoon. My youngest daughter is also crazy about that cartoon. OMG, you're so creative! That was really smart of you to utilize what you have at home instead of buy an expensive costume at the mall. And you did it like a pro!